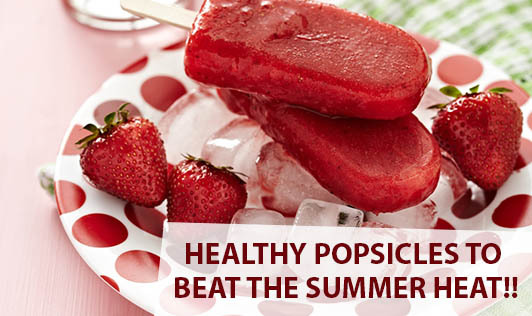 Healthy Popsicles to Beat the Summer Heat!! • Blend fruits, yogurt and sugar in a blender until smooth or chunky as desired. • Fill this mixture in paper cups upto 3/4th full. Cover the top of the cup with an aluminium foil and poke the popsicle stick through the centre of each cup. • Freeze them for 5 hours. To serve, peel off the paper cup and remove the foil. • Blend all the ingredients together until completely smooth. • Pour the mixture into ice pop moulds and insert popsicle sticks. • Freeze them until firm for several hours or overnight. This recipe can be repeated with other fruits too like oranges, mango, pineapples or musk melons. • Blend cucumber into a fine mixture. • Add lemon juice, minced mint leaves and honey to this mixture. • Mix well and pour it into popsicle moulds. • Freeze it overnight until firm. These are just a few ideas to trigger your creativity. While you enjoy your own unique popsicle recipes, do not forget to share it with us!